Come enjoy an up-close and intimate look at wolves and wolfdogs on this semi-private guided sanctuary tour with plenty of photo opportunities. Gain a better understanding about wolf behaviour through the wolfdogs at the sanctuary and how this behaviour fundamentally differs from domestic dogs. This is also a great opportunity to learn about the importance of wolves in our ecosystem, and why it’s so important to preserve them in the natural environment. You will also have plenty of photo opportunities and ample time to speak with a sanctuary team member leading the tour. 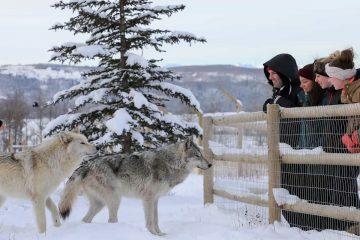 This exclusive tour has limited availability and restricted numbers per tour to ensure the wolfdogs stay inquisitive and close during your visit, and is the only sanctuary tour that offers an up-close and personal experience with wolfdogs. 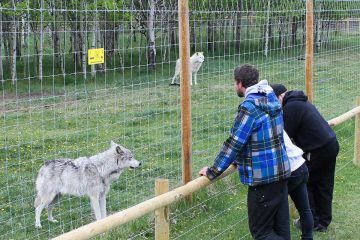 Enter an enclosure and interact with the animals while learning about wolfdogs and wolf behaviour. This all-inclusive tour offers plenty of photo opportunities and an up-close and personal experience with wolfdogs. Visitors have the option of joining the Intro Tour, where you can enter another enclosure with a guardian with only a short barrier separating you and a wolfdog pack for additional photo opportunities. An interpretive, self-guided walk through the sanctuary allows you to view the various packs of wolfdogs at your own pace. 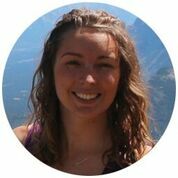 The tour itself is a 45 minute experience, however you will have lots of time before or after your tour to explore the entire sanctuary on a self-guided walk. The experience includes a detailed talk in a small group inside an enclosure to understand more about wolves and wolfdog hybrids. The wolfdogs themselves are tame but not domesticated, which means they will be curious and may approach guests who are relaxed and quiet. Following this, you can visit another pack of wolfdogs from behind a short barrier and then explore the entire sanctuary at your leisure on a self-guided walk. The Yamnuska Wolfdog Sanctary is located on Range Road 53 on the 1A Highway, 60 minutes from Banff and 10 minutes from Cochrane. Detailed driving directions will be included in your booking confirmation. Tour times are 10.30am, 12pm, 2pm and 3.30pm, all year round. The tour runs every day from Thursday to Monday, as the Sanctuary is closed on Tuesdays and Wednesdays. 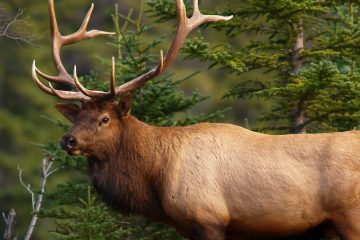 The sanctuary has a dress code for this tour, please do not wear sheepskin or down feather coats, or any clothing with fur or faux fur, hanging lures, or fur like trim. Please dress comfortably and wear warm clothes as you will be seated outside for the duration of the tour and be sure to bring a camera! How close can I get to the wolfdogs? Guests will be very close to the animals, but are required to stay seated in the viewing area for the comfort of the wolfdogs and to ensure a better experience for the guests. The wolfdogs will be curious and may approach very close to guests who are relaxed and quiet. There is a 48 hour cancellation policy, you can change/cancel or refund your booking 48 hours outside your booked tour (up to 7 days for group bookings). Tips are not expected but our staff certainly appreciates them. If you had a great day and wish to indicate so through a tip to the staff they are graciously accepted. There is a maximum of 10 people per tour. Children must be 15 years and older. Tours can not run with just 1 guest due to guest safety, please call to book with other guests. Please do not bring your own dogs to the Sanctuary, in your car or otherwise. This is a health and safety issue and greatly upsets the wolfdogs. No smoking is permitted on the sanctuary grounds (this includes the parking lot).